This "poetic, poignant" (US Weekly) debut features last great adventures, unlikely heroes, and a "sweet, disarming story of lasting love" (The New York Times Book Review). Otto wakes to a note left on the kitchen table. "I will try to remember to come back," Etta writes to her husband. Otto has seen the ocean, having crossed the Atlantic years ago to fight in a far-away war. He understands. But with Etta gone, the memories come crowding in and Otto struggles to keep them at bay. Meanwhile, their neighbor Russell has spent his whole life trying to keep up with Otto and loving Etta from afar. Russell insists on finding Etta, wherever she's gone. Leaving his own farm will be the first act of defiance in his life. Moving from the hot and dry present of a quiet Canadian farm to a dusty, burnt past of hunger, war, and passion, from trying to remember to trying to forget, Etta and Otto and Russell and James is an astounding literary debut "of deep longing, for reinvention and self-discovery, as well as for the past and for love and for the boundless unknown" (San Francisco Chronicle). 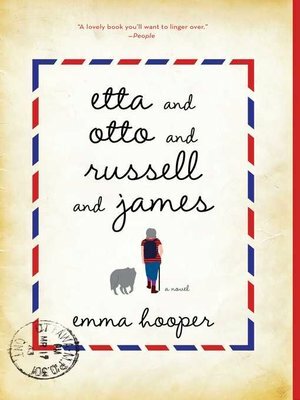 "In this haunting debut, set in a starkly beautiful landscape, Hooper delineates the stories of Etta and the men she loved (Otto and Russell) as they intertwine through youth and wartime and into old age. It's a lovely book you'll want to linger over" (People).